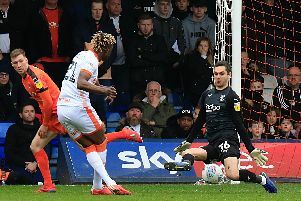 Luton Town remained eight points clear of fourth-placed Notts County after the Magpies went down 3-1 at relegation threatened Chesterfield this afternoon. Sid Nelson put the Spireites in front on 16 minutes, while Zavon Hines doubled the advantage six minutes before the break. Dan Jones pulled one back for County with five to go, but Kristian Dennis' stoppage time penalty sealed the win. It means that Luton, who beat Barnet 2-0 yesterday, have a healthy advantage over the Magpies with both teams having played 39 games. Next week, Notts County head to third-placed Wycombe, with Luton at Colchester, while Accrington visit Mansfield and Exeter City travel to Lincoln City.